MAUNGDAW, Arakan State — The border trade gate in Maungdaw Township has been closed indefinitely since Nov. 3, in order to prevent “unnecessary risks and insecurity,” according to U Kyaw Khin Myint, the regional head of Ministry of Commerce Department. “When the territory is unstable, it’s automatically shut down,” he said of the trading gate. The Maungdaw Border Trade Chamber of Commerce chairman U Aung Myint Thein confirmed to The Irrawaddy on Friday that although the authorities have not issued an official statement on the matter, verbal warnings have been given to traders not to depart from the area with cargo ships until the region has become more stable. However, the Bangladeshi government, across the Nat River, has not closed the border to trade, leading merchants to wonder if they can continue the sale of their goods, even though Burmese authorities say they cannot guarantee the traders’ security. The distance between the Maungdaw jetty and Teknaf District in Bangladesh is about seven miles, and normally takes around two hours for cargo ships to traverse. Meanwhile, many traders from Maungdaw are delivering commodities to Teknaf via the Arakan State capital of Sittwe. Merchants have garnered additional transportation expenses through this process, as some of the main exports—like dried fish, prawns, and seafood—are spoiled if stored for long periods of time. One of Burma’s products in highest demand in Bangladesh is bamboo, from which fencing and thatched roof are made. Yet because of its weight, small motorized boats cannot efficiently carry large amounts of bamboo. Traders normally create a floating raft-like platform of around 50,000 bamboo poles, and then push it for around two days along the coast—with the help of five men—before it reaches Teknaf further south, where it can fetch a price of around 12 million kyats (US$9,135). Muslim trader U Anowar of Shwe Mya Ratanar Enterprise, said that two months ago, he was instructed by government authorities to “wait for a while” before shipping his bamboo to Bangladesh. He has eight rafts of bamboo poles waiting, and stands to lose a large sum of money if they cannot be sent to Teknaf soon. “The bamboo is going to be spoiled and damaged. If the government could allow it, I would like to transport my rafts,” U Anowar said. Bamboo as a resource has become increasingly rare in Maungdaw in recent years, as much of the growth in the nearby May Yu mountain range has been harvested. 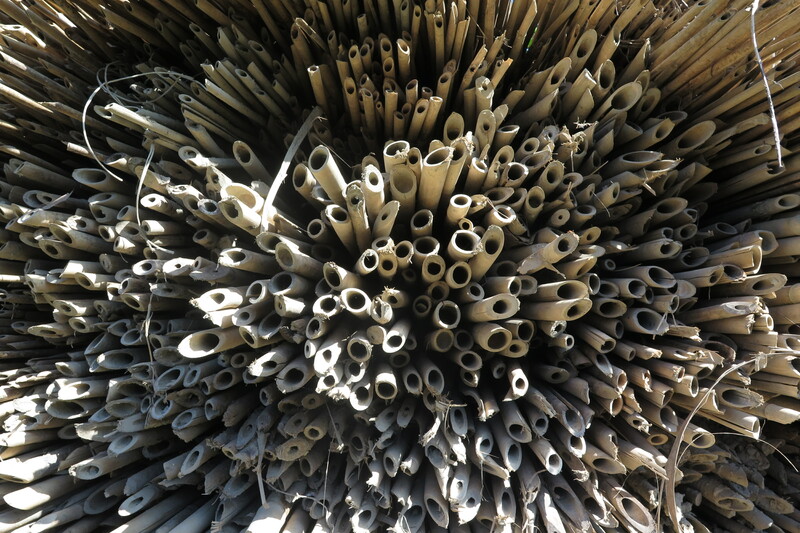 Traders now rely on bamboo from Kyauktaw, Minbyar, Mrauk-U and Ann regions in Arakan State. Border merchants bring it from Buthidaung Township by bus. The ruling National League for Democracy (NLD) government officially declared Maungdaw Township a military operation zone after three border police posts were attacked by militants in October. The area has since been under lockdown, with a navy crew surveilling the waterways in search of those suspected of involvement in the attacks. Ministry of Commerce official U Kyaw Khin Myint acknowledged that trade at the Maungdaw-Teknaf border is lower than other points, such as Myawaddy-Mae Sot on the Thai border and Muse-Ruili on the Chinese border. During the 2015-2016 fiscal year, the Ministry reported just $5.44 million from both export and import through the Maungdaw border trading post. Until November, income from Maungdaw during the 2016-2017 fiscal year was around $3.2 million, indicating that this year’s financial gain would be lower than that of the previous year. In order to boost trade volume, the Burmese government had been constructing a new border trade zone on the outskirts of Maungdaw in recent years, with fundamental structures nearly completed, said U Kyaw Khin Myint. But Maungdaw Border Trade Chamber of Commerce chairman U Aung Myint Thein acknowledged that the flaring of clashes in Maungdaw means that the project will be further delayed. Trader U Anowar remembered that after the 2012 riots shook the region, it took almost one year for trading and business to return to normal in the township. “Conflict has never brought good things for us. It really harms the traders,” said U Anowar.